We’re just a few weeks into 2016, and I am trying to hit the ground running. I have a lot of ideas I am hoping to bring to fruition this year. Watch this space! 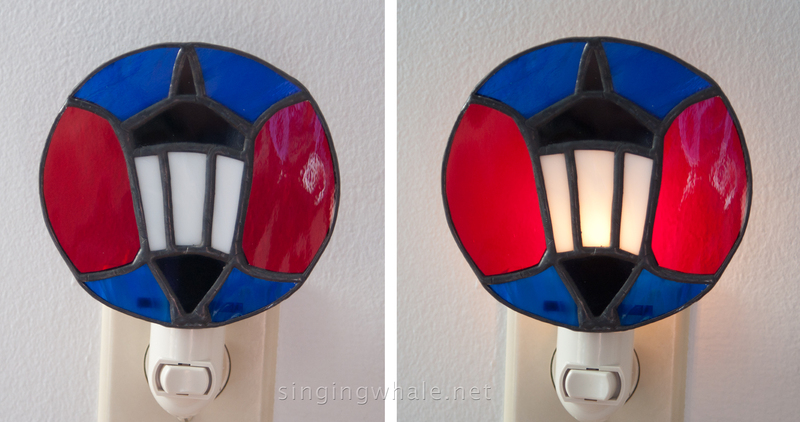 To get things started, I made a nightlight of one of my favorite icons, the lamp at Wellesley College, my alma mater. I am very lucky and privileged to have gone to school there as it’s an amazing place that has graduated many amazing human beings since 1875. It’s humbling to be amongst those folks. 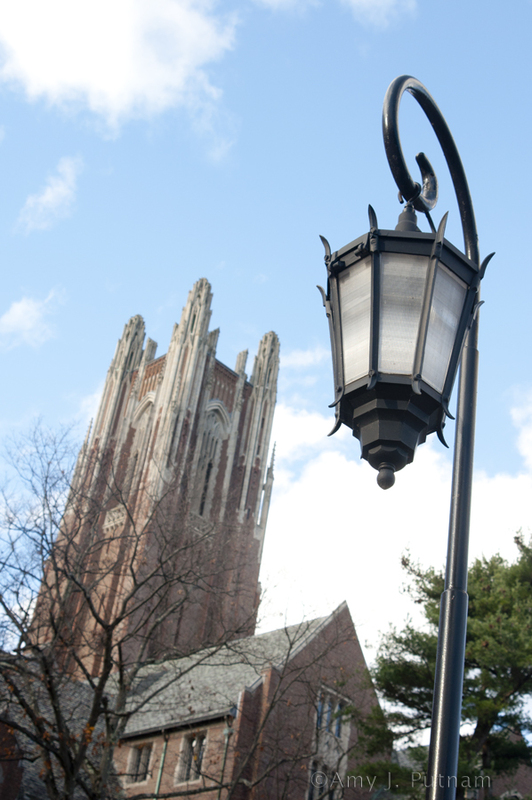 We have several icons and images which are indelibly Wellesley, including a lamp post that is found all over the campus. Frequently, one might see representations of the lamp and post together, as seen in the photo here (along with one of our other icons, Galen Stone Tower). But, I haven’t been able to find a good way to do the post’s curl without ‘interrupting’ it with other seams and break lines to get the curve in there properly. So I decided to forge forward with the lamp alone. When shopping for this piece, my goal was to find the right glass for the panes of the lamp. I really dislike seeing the light bulb behind any nightlight, so the intention is to get something that shows the light, just translucent enough. 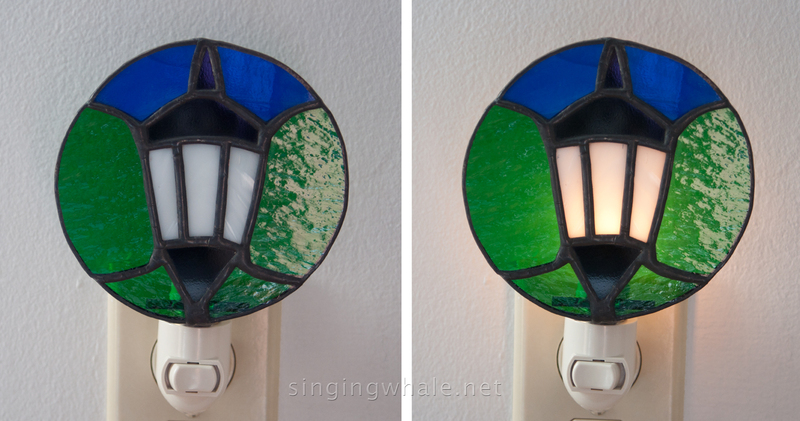 I found success with this white glass seen in the first pieces, below, and I love how the lamp just glows in front of the light. For the round background, the school’s color is a deep blue. Each class is also assigned a color, one of four which rotates as a class graduates and new one arrives: purple, yellow, green, and red (I’m a purple class. Simply mauvelous). We also have students and alums who have attended outside of traditional college years. Because their studies often encompass more than the usual 4 years of a bachelor’s degree, they are represented by all four colors. So in making the first samples of this pattern, I did a variety of combinations to show blue with class colors either singly, or showing all four. And this certainly does not exhaust possibilities, as background can easily be all one color. After some hemming and hawing about how to pull this off, I am pleased with the end result. Scroll down to see more about a suncatcher version of this piece. 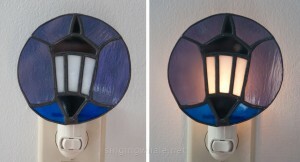 The glass of the night light is 4 1/8″ in diameter. 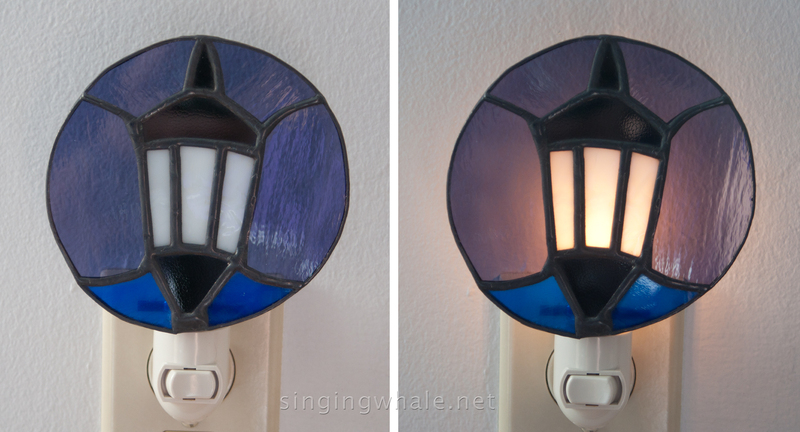 The length, with the nightlight works, is 5 1/2″. They are $40 each plus shipping. 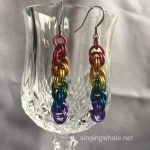 Orders can be placed through the made to order listing in my Etsy shop. Contact me here or there with any questions. Thanks! 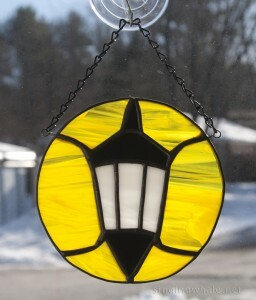 Now there is a suncatcher, too! The pattern is essentially the same, but the overall piece is larger, coming in at 5 3/8″ in diameter. I’ve made four initial samples in that as well, pictured below. 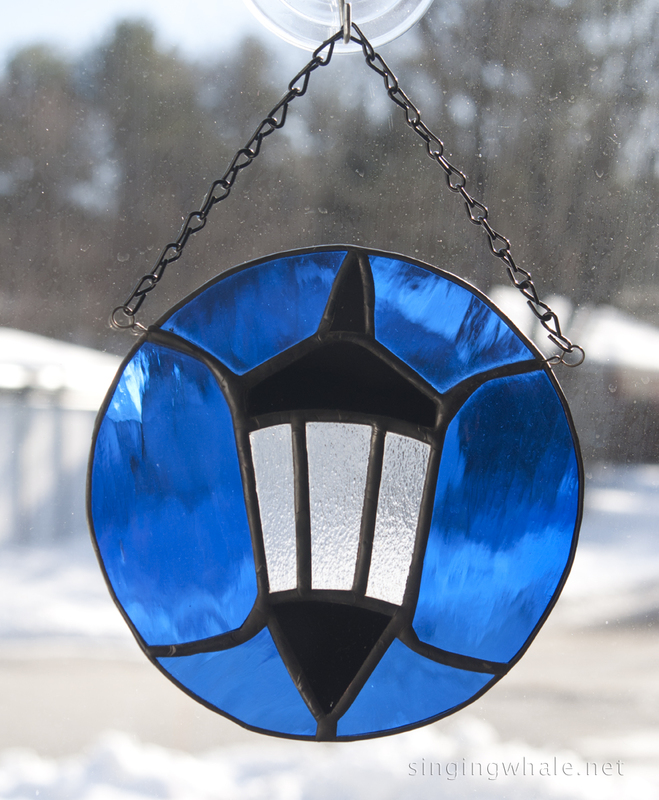 So if you don’t have need of a nightlight but would like a piece of Wellesley in your window, this lamp suncatcher could well fit the bill! 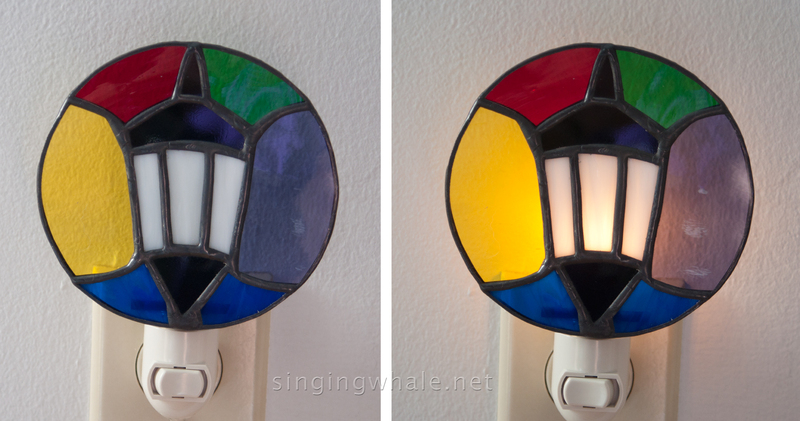 They are $30 each, and I have also created a made to order listing on Etsy for these. Hanging chain is included with each one. As with the nightlights, there is a wide range of possibilities for color layouts, with just a few seen here. 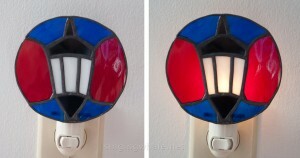 Unlike the nightlights, there is a choice between two glass types for the panes of the lamp itself. I can do it in white, or in clear satin, a textured glass, which allows more natural light through. 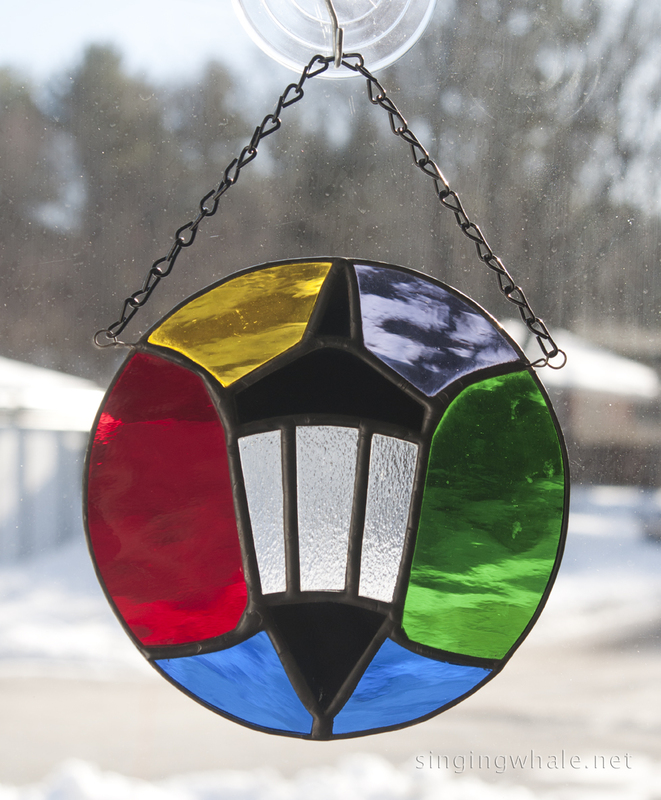 The all blue and multicolored suncatchers below have the clear satin in the lamp, while the green/blue, and all yellow versions have white glass. 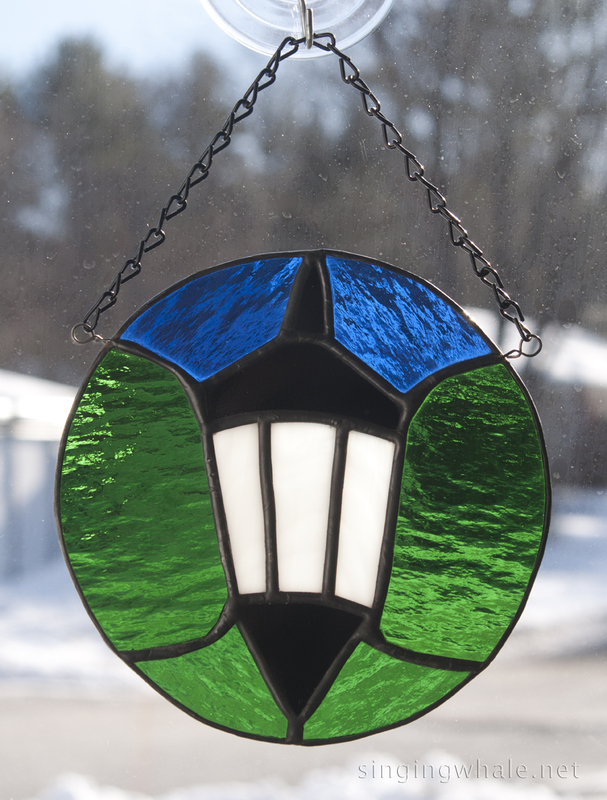 This entry was posted in new works, nightlights, suncatcher and tagged lamp, nightlights, suncatcher, Wellesley College, Wellesley icon. Bookmark the permalink.